Pension plans and retirement are associated with the time when a person’s working days are done and either they choose to go on pension or retire. These two concepts are confusing because of the time in one’s life when they become appropriate. It helps to understand that a pension, original called a ‘defined benefit’ is linked to a monetary payout while retirement is linked to a time frame and an ending of working life. The name retirement pension has been adopted in some cases to link the fund and the timing together, but they are not the same. Employees can opt for early retirement and that would be before sixty. Corporations and social security set retirement at sixty five and sometimes a person can take early retirement but continue to work part time or become a consultant. 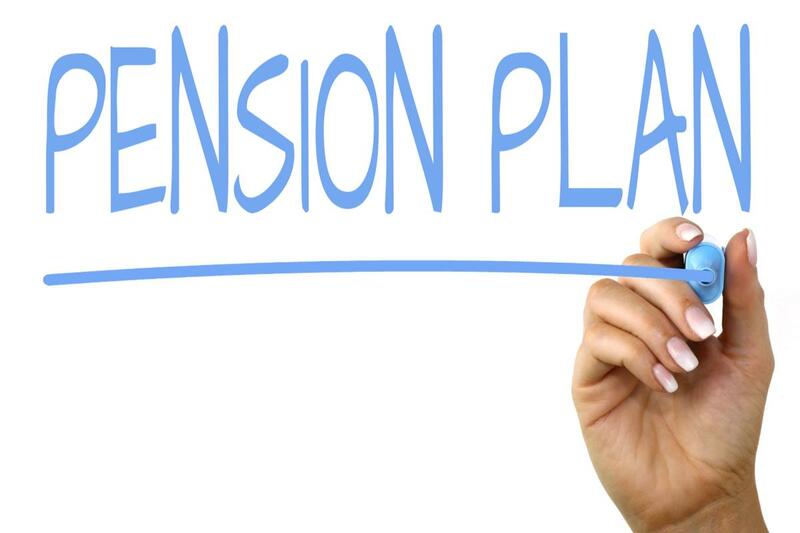 Pensions, because they are linked to money saved or pledged by the company, are determined by the fund and the conditions governing the pension. The pension will be paid out according to calculations based on years’ service and contributions. The basic difference then is time and money. Pensions related to money and retirement in conjunction with a time in a person’s working life. A pension is an amount of money that will be paid to you by the company you work for when you retire. The amount you have accumulated is kept in a fund based on how long you worked and how much you earned and contributed to your pension fund. You withdraw a lump sum, or you can take monthly payouts. The development of the pension fund is a means can to offer some financial security to employees when they retire. Young people are urged to start early so that on retirement their pension will match their financial needs. Pensions promise the employee an amount of money based on years of service and percentage of income. The employer is responsible for contributing the amount that will be paid out on retirement . Pension plans are not as common as they used to be but remain an integral part of government and Union employees. There are different plans and options ranging from the Defined Benefit contribution plan to the 401K or 403B plans. The 401K plan entered the system about forty years ago and is named after the revenue act in 1978 that the plan was based on, they are a means of an annuity plan and could be governed by endowment policies or mutual funds. A person contributing to a pension fund should make sure they are well informed off the policy types and how the funds are managed. Pensions can have different payout options and can even be spousal funds to benefit the spouse of the family. One can create a pension fund through investing a lump sum of money into an annuity with the fund being paid out in guaranteed payments on retirement. It provides some income to a person who is released from their employment due to their age. The fund is developed by the employer for the employee. It can be a lump sum or monthly amount and the employee can opt for either plan while continuing to work. Retirement is the time in your life when you decide to withdraw from or leave the occupation you are currently working at. Retirement can be age related or just the time in your life that you decide to discontinue the work you are doing. Retirement in the corporate world, may have a pension linked to the age of retirement, in which case on retirement you will receive the pension. Retirement is the time in your life when you have enough funds to be able to release your self from your mode of creating income. In other words, you have enough funds in a retirement fund or pension to continue to support yourself. Retirement is a relatively new concept that has come about as people live longer. Families used to care for the elderly after they could no longer work, but this culture of family providers is less apparent in modern times. Many people plan for their own retirement and, with the help of a financial advisor, will put savings plans in place to create financial independence for the day they retire. The financial advisor considers income and expenses, medical requirements, entertainment, hobbies and life style and then plans for the day you need to sustain that lifestyle without an income from a work related position. It marks the time a person decides to discontinue working in an environment. Acknowledging retirement encourages a person to plan for that time. Retirement can be linked to a pension plan, so the two events coincide. A pension plan or fund is a calculated monetary system and determined by the employer to assist the employee financially. The retirement concept is more flexible, and you can ‘choose to retire’. Retirement can e a time in your life when you have stopped fulltime employment but are ready for part-time employment or make yourself available to be a consultant. The Pension plan usually has fixed calculations guided by the employee’s length of time in service and contributions made to the fund. This can then be paid out in a cash sum or in monthly installments. Retirement may or may not be attached to a company fund or to a private fund set up by the employee. Retirement is generally associated with ending your working life, but you can retire from a game or a competition. That would be our personal choice to leave the game and retire. Both retirement and pension have benefits to employees. It is advisable to be able to plan for retirement. Pension funds ensure the retiree is provided for in their mature years. The person contributing to these funds needs to be on the lookout for scams and misappropriation of their money. The composition and management of the funds need to be checked and the benefits suit the needs of the retiree. A pension is more controlled and constructed according to salary and service. The time in the company is represented by the company’s contribution to the pension. Retirement comes at an age when the employee decides to withdraw from the workplace and continue as a consultant or find other part-time work. Some companies have retirement ages. Different types of pension funds may be created to provide the same promise of financial means after the employee has finished their work career. 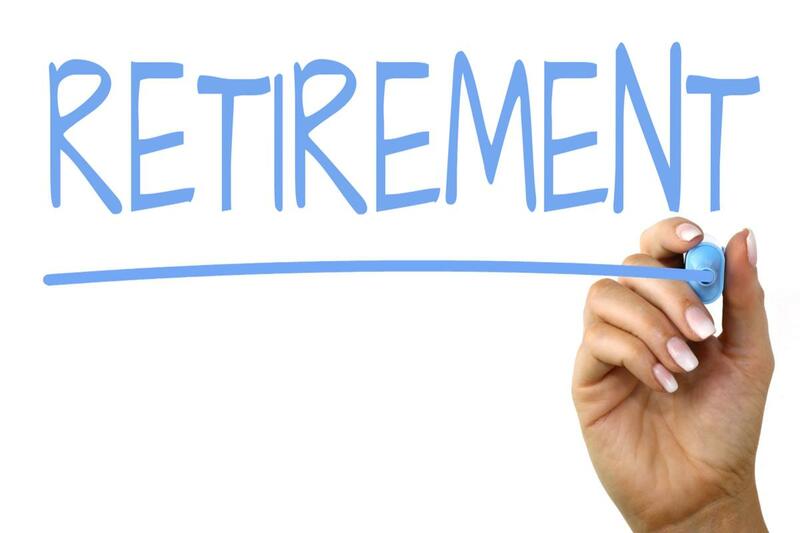 Retirement remains as the time chosen to complete a career or work scenario the fund that would accompany that time may not necessarily be created by the company. Retirement and pension can go hand in hand, but the values of these concepts are different, and they offer different life styles. Pension a secure monetary peace of mind and retirement a time to end off a working career but with careful planning have a fund available to support the retirement age. A person can reach their retirement age and draw a pension form their company if the company set up a pension fund. Christina Wither. "Difference Between Pension and Retirement." DifferenceBetween.net. 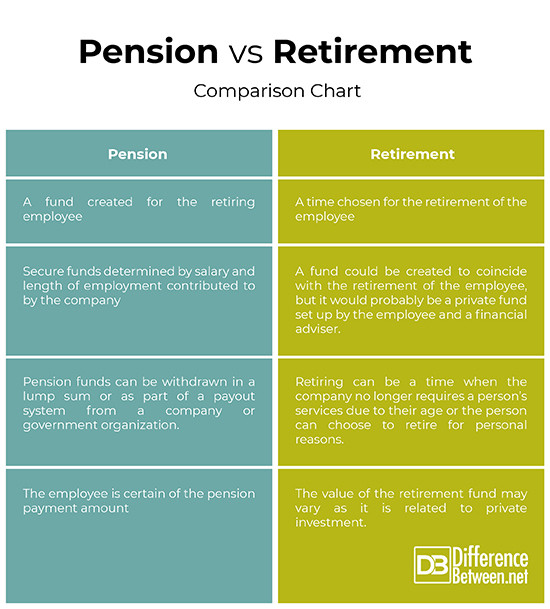 September 20, 2018 < http://www.differencebetween.net/language/words-language/difference-between-pension-and-retirement/ >.